Oven mitts have a rough time in my household. Between my wife accidentally burning them and the inevitable wear and tear on the lining through repeated use, they start to get ratty. And once they get ratty, your chances of getting burned through an unprotected patch goes up. Looking for an alternative, my wife picked up a silicone-based oven mitt, which have become fairly easy to find. While it works well, it’s both too springy and too rigid, and I can’t quite bring myself to trust it. If the mitt doesn’t fit, or if it’s extremely awkward to use, dropping things becomes a real concern. 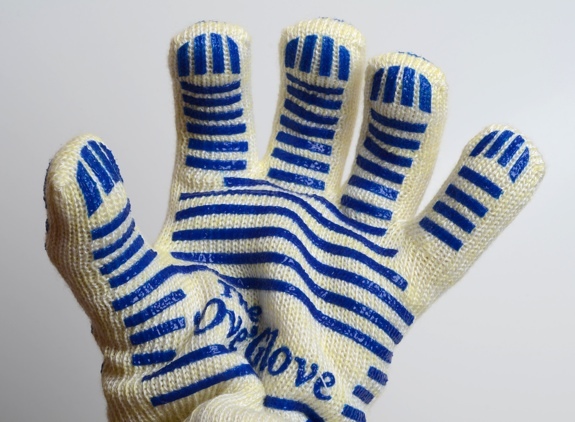 Enter the Ove Glove, a form-fitting oven mitt that’s rated to 540 F, and that can, if the box is to be trusted, remove hot dishes from the microwave (yay! ), flip metal meat-and-veggie kebab skewers on the BBQ (double yay! ), and even remove a hot light bulb from a socket while it’s still on (hunh?). In practise, it’s actually pretty neat. 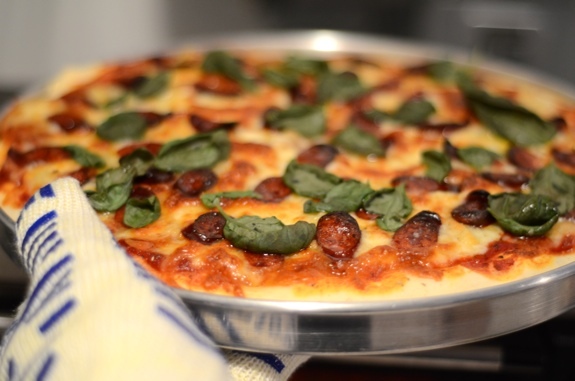 As I held a hot pizza pan — fresh from a 450 F oven — while I shot pictures for the site, I could barely feel any heat. Any time I’ve used it, I’ve been happy with the heat protection. The version I have also comes with silicone grip material on the glove’s surface, which is handy when gripping pans with a slippery surface. But they’re not perfect. The way the tips of the fingers are stitched together makes it hard to grab small areas of a pan precisely, though I expect I’ll get better at it with time. 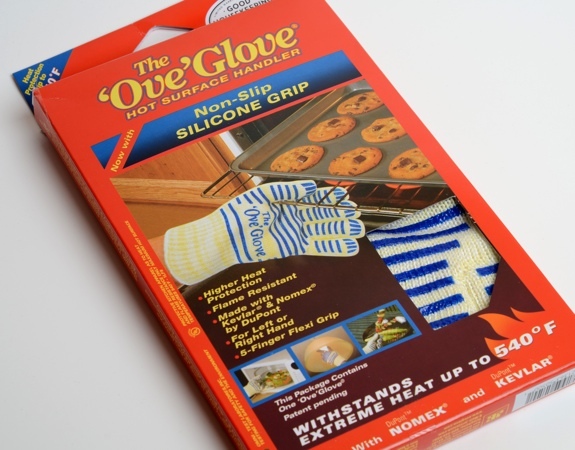 The packaging also warns that the Ove Glove isn’t waterproof (or steam-proof), which means it shares a common oven-mitt flaw: if you grab something hot while the glove is wet, expect the liquid to transfer the heat directly to your soon-to-be-burned hands. Still, it’s the best oven mitt I’ve ever found for what I routinely use it for. It’s a welcome addition to my kitchen. Hot homemade pizza, fresh from the oven, removed with the help of an Ove Glove. Nice. Cost: About $20. I got mine as a gift. Value for cash money: Not bad. The only part that rankles is that they’d even bother selling a package with a single glove. Unless you’re MJ, one glove just doesn’t cut it. Availability: London Drugs, any number of home stores. Kevlar? : Yes, the Ove Glove is made with Kevlar, the same stuff they use to make protective ballistic vests. While that’s cool to know, I don’t plan to stop any bullets with my Ove Glove. They’re neat, but they’re not magical. The same rules of kitchen safety still apply. The verdict: I love mine. I’ll be getting a second one to complete the set. The Ove Glove, in its familiar packaging. I always wondered what using one of those would be like. Thanks for the review! Also, your pizza looks fantastic, care to share a recipe? Thanks! The pizza is (if I remember correctly) honey-garlic pepperoni and pineapple with cracked pepper and wilted basil. I’m still tinkering with dough recipes, but the one I’ve been using lately is based on a recipe in Baking with Julia. It’s got a much more soft, chewy and pillowy texture than a lot of other doughs I’ve tried. We have two Ove Gloves and just love them! We went from those silicone ones to the Ove Glove and there’s no comparison. The Ove Gloves win hands down! Agreed. But I still keep the silicone one around for when I’m working with anything with hot vapour. The woven fabric in the Ove Glove doesn’t protect against steam.